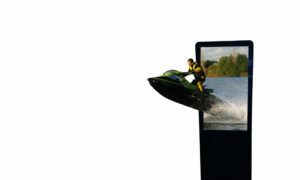 With TruVu Glasses-free 3D, parts of your image literally appear to be leaping off the screen! The 4K display delivers the best depth performance, widest viewing angle, and deepest black levels. Unprecedented ultra high definition resolution displays are available in both 2D and Glasses-free 3D. We offer 3D Portrait displays with best-in-class lens design and image processing. It’s the world’s first 4K Glasses-Free 3D Signage Display for full HD 3D experience. High contrast and no visible brightness loss like traditional glasses 3D TVs. The autostereoscopic 4K portrait LCD displays offer a magnificent resolution of 2160×3840 pixels. The 4K display delivers the best depth performance, widest viewing angle, lowest cross-talk, and deepest black levels available.